Surrounded by miles of open water in the gloriously green Sea of Cortez, Miriam is shocked to discover that she and the rest It was supposed to be the trip of a lifetime. To ask other readers questions about They All Fall Down, please sign up. I, too, had waited for something magical to happen in my life. I thought it had been meeting Billy, then marrying Billy. I thought it had been giving birth to Morgan, but then... no. When would it happen, that something magical? On this island, maybe? Maybe. Of all the novels published by Agatha Christie, And Then There Were None has been the most adapted. What is it, exactly, that calls us so much towards the concept of terrible people isolated and left to determine their own fates? Whatever it I, too, had waited for something magical to happen in my life. I thought it had been meeting Billy, then marrying Billy. I thought it had been giving birth to Morgan, but then... no. When would it happen, that something magical? On this island, maybe? Maybe. Of all the novels published by Agatha Christie, And Then There Were None has been the most adapted. What is it, exactly, that calls us so much towards the concept of terrible people isolated and left to determine their own fates? Whatever it is, it's proved a winner - spawning endless TV series, and I believe planting the spark for such juggernauts as Battle Royale and The Hunger Games. So with such a huge crowd of inspired bys and adaptations of, was there a place for a new novel to join their ranks? In my opinion, absolutely. There's comfort in knowing how the story has gone before, and a wealth of new discovery when you wait to see what a new storyteller has brought to the table. And Rachel Howzell Hall knocks it right out of the park! Her characters are superb. It's hard to write a three-dimensional set of thoroughly unpleasant people, but they absolutely were - just like real life, people don't just act badly in a vacuum. No, instead they have a range of motivations; from the enthusiastic and overly drugged up, to the mentally ill, to the fantasist convinced everyone would understand if they would just let them tell the real story. I went into this with high expectations because I love Hall’s detective series and “remakes” of And Then There Were None (strangers suddenly deserted together and one by one they start to be murdered). Hall totally delivered! I don’t want to say much on plot, because the not knowing is a fun element of these stories, so I’m going to focus on why this really worked for me. I loved Miriam Macy–who accepts a trip to a Mexican island in hopes of winning a reality show and getting her life back in order–as the point of view because she clearly has baggage but is a fighter. And Hall used a lot of clever crime genre elements that all blended really well together: a main character known to lie who has anxiety and doubts what she sees; everyone has a motive so the killer can be anyone; they’re all stuck together because of a storm so they’re forced to solve the mystery or fight; the challenge of who we are as people when we’re forced to face our worse self; everyone’s got a secret they’re hiding; the boiled frog fable–you’re in danger and you didn’t even realize it until it’s too late! Hall is also brilliant in how she modernized this tale while staring the problematic aspects of the genre dead in the eyes. I’ll read anything she writes. I was so excited to read Rachel Howzell Hall's take on And Then There Were None, and she did not disappoint! I've only read her Lou Norton series previously, and this was something completely different, but with the same quality that makes her other books so gripping. Miriam Macy receives an invitation to participate in a reality show on an island in Mexico, which conveniently gives her the chance to escape her circumstances at home. But things on the island are not what she expected, and soon p I was so excited to read Rachel Howzell Hall's take on And Then There Were None, and she did not disappoint! I've only read her Lou Norton series previously, and this was something completely different, but with the same quality that makes her other books so gripping. Miriam Macy receives an invitation to participate in a reality show on an island in Mexico, which conveniently gives her the chance to escape her circumstances at home. But things on the island are not what she expected, and soon people start dying... Miriam is no Lou Norton--she's kind of terrible in a lot of ways, but so is everyone else on the island, and whatever else she is, she's a compelling character, and I was completely engrossed as the tension kept escalating. If you've read the Agatha Christie novel, a lot of the twists won't come as a shock to you, but still, this is a really fantastic take on the story. It's dark and twisted, and I enjoyed every second of it. Rachel Howzell is brilliant. She created this beautiful, imperfect and funny character as this mystery's protagonist and I instantly fell in love with her. The author nailed the prologue, it was claustrophobic and suspenseful enough to compel me to go forward and figure out what the heck just happened. THEY ALL FALL DOWN is a binge-worthy mystery full of twists and turns. We have unexpecte A luxurious trip gone wrong? A possibly-paranoid protagonist? A group of unlikeable characters? Sign. Me. Up! "Why were these people really brought to this house in the middle of the ocean? ", "Who will be the last one(s) standing?" And I was definitely stunned at the creative ways in which each guest has met their fate. As the story progresses, it is clear that our protagonist Miriam will not sit back and let these strangers get to her head. It's only a matter of time before she puts on her detective hat and begins to uncover the truths behind this trip's mystery, stunning us readers with the discoveries she's making within the halls and rooms inside of this house. This travel journey has now turned into a murder spree, but how had it come to this?! It was supposed to be the trip of a lifetime! Okay, that was disappointing! Let me make it clear first that I am totally in support of retellings and adaptations of classics, and it's always fun to read a familiar book with a slightly different take and twists of its own. And Then There Were None is one of my favorite books by Agatha Christie, and They All Fall Down is its adaptation, so I was very excited for it. The premise and the prologue are both excellent, the setting of a remote island off the Mexican mainland was well done, there is Okay, that was disappointing! Let me make it clear first that I am totally in support of retellings and adaptations of classics, and it's always fun to read a familiar book with a slightly different take and twists of its own. And Then There Were None is one of my favorite books by Agatha Christie, and They All Fall Down is its adaptation, so I was very excited for it. The premise and the prologue are both excellent, the setting of a remote island off the Mexican mainland was well done, there is some funny banter in between as well, and the newspaper clippings was a nice touch, but that's about it. Throughout the book, the writing felt jagged, I was hoping for a smoother delivery but it was quite choppy. I found the narrator Miriam to be highly irritating, and at times I couldn't stand being inside her head. I also felt, the other six characters were very hurriedly introduced that got confusing and I couldn't keep track of who's who later. The story dragged up until the halfway mark, then felt very rushed and the conclusion was just okay. I easily guessed the killer and also how that first kill happened. Towards the end I couldn't wait for it all to just be over. So, overall, I found this to be pretty underwhelming. However, I know a few friends have really enjoyed this, so I'll say read a few positive reviews and decide if you'd like to give this one a go. Sadly, it didn't work for me. I am a fan of Rachel Howzell Hall's Elouise Norton series, so when I saw that she had a brand new book coming out I had to request an ARC. I went into THEY ALL FALL DOWN with some expectation of what I was going to get and had to promptly throw them all out the window. This story is made up of characters who are all harboring dark secrets and are coming together with individual ulterior motives. Even our main character Miriam comes in with a murky story that doesn't quite stand up to scrutiny. W I am a fan of Rachel Howzell Hall's Elouise Norton series, so when I saw that she had a brand new book coming out I had to request an ARC. I went into THEY ALL FALL DOWN with some expectation of what I was going to get and had to promptly throw them all out the window. This story is made up of characters who are all harboring dark secrets and are coming together with individual ulterior motives. Even our main character Miriam comes in with a murky story that doesn't quite stand up to scrutiny. With Miriam, truth is subjective and facts have to be explained with her own version of context. There are actually moments when I wasn't sure if what she was saying and believing was real or part of her own 'improved' narrative that she is providing to justify her own actions. 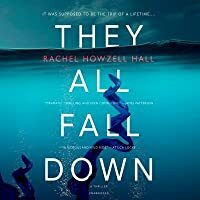 They All Fall Down is my first Rachel Howzell Hall novel but it will not be the last! What a blast of a good time—I always love a retelling of And Then There Were None and Hall's rendition is a good time. Miriam Macy is an excellent main character, but Hall does not rest on her laurels with Miriam and she gives just as much keen detail to her supporting characters. Even though this was a retelling I was on the edge of my seat, waiting to see what happened next. My only complaint is that the endi They All Fall Down is my first Rachel Howzell Hall novel but it will not be the last! What a blast of a good time—I always love a retelling of And Then There Were None and Hall's rendition is a good time. Miriam Macy is an excellent main character, but Hall does not rest on her laurels with Miriam and she gives just as much keen detail to her supporting characters. Even though this was a retelling I was on the edge of my seat, waiting to see what happened next. Damnit this was fun. Give me more Thriller/suspense books with funny protagonists written by WOC. To be fair, this is basically a retread of Agatha Christie's And Then There Were None, but I liked it a lot even so. 4.5 stars!!!!! this was so good and enjoyable. couldn't put it down. this is a homage to And then there were none. totally loved the main character who was hilarious. I love Agatha Christie so this was a must read as soon as I'd heard about it. As this is a modern retelling of Agatha Christie's And Then There Were None there's no question how this was going to end and I still couldn't help pulling for narrator Miriam to make it out alive. She was a dedicated fabulist (for reasons never revealed) and a self-saboteur but I wanted her to find redemption and get to see her daughter again. So silly really but well done by the author, coaxing those feelings out of I love Agatha Christie so this was a must read as soon as I'd heard about it. As this is a modern retelling of Agatha Christie's And Then There Were None there's no question how this was going to end and I still couldn't help pulling for narrator Miriam to make it out alive. She was a dedicated fabulist (for reasons never revealed) and a self-saboteur but I wanted her to find redemption and get to see her daughter again. So silly really but well done by the author, coaxing those feelings out of me. This was my first read by Howzell Hall and I very much liked her writing style. I laughed out loud. I gasped. I highlighted passages. There were news clippings relating to the individual crimes of each person in the party and I thought those were well done. It gave the un-self-serving version of events the characters were never going to share. There's a lot of scene and mood setting and getting a feel for the seven who make up this morally bankrupt party and it's not until chapter 15 (of 35) that the first murder occurs. I have a peeve about murder mysteries taking a long time to get to the actual murder but as I was already familiar with ATTWN, I was able to mostly overlook it. Going into this, I had impossibly high expectations. And Then There Were None is one of my all time favorite books, so any adaptations I MUST read (and will subsequently hold to absurdly high standards). What worked for me - I don’t want to give anything away, but I enjoyed the twist on the poem from And Then There Were None. What didn’t work for me - I truly hated the narrator. I could understand what the author aimed to do with the clearly flawed character (a person that fit so well into the sto Going into this, I had impossibly high expectations. And Then There Were None is one of my all time favorite books, so any adaptations I MUST read (and will subsequently hold to absurdly high standards). What didn’t work for me - I truly hated the narrator. I could understand what the author aimed to do with the clearly flawed character (a person that fit so well into the story) I just personally didn’t enjoy hearing her talk. She just annoyed me. Also, it was extremely slow for the first half, and then predictable for the second half. What a wild, fun, tense, frightening, horrible ride with a bunch of people I'm glad I don't know personally. One of my favorite things about RHH's writing, besides her skill at storytelling, is that she creates believable characters. Every one of these characters was complex, and awful, and human. I loved it, even when I wanted to push them all off a cliff. Sarah Ooh, good call on the PopSugar prompt, I totally missed that for this one! Modern retread of Christie's And Then There Were None? Sure. Kick-to-the-gut final line in the except? Dang. Now I'm really interested. Kristen Lepionka describes as "terrifyingly good"? Let me at it! I couldn’t put this one down. I had to know what happened to these characters, none of which were particularly likable. But it was good escape fodder. Thanks to an ARC two days were well entertained. I flat out enjoyed this book! Seven strangers brought together on a tropical island under false pretenses, each harboring a secret... What's not to love? Hall has given us a twisty, fun and highly entertaining thriller. Thank you to the publisher, Forge Books, for providing an ARC in exchange for an honest review. If I have an all-time favorite story trope it has to be an eclectic cast of characters in a remote location with individuals being picked off one by one. I think it goes back to my childhood when I was in love with the game Clue and when I first saw Agatha Christie’s book And Then There Were None made into the movie Ten Little Indians. So naturally when I saw the premise for They All Fall Down—mansion in a Mexican paradise where a group of strangers gather only to be picked off one by one—I coul If I have an all-time favorite story trope it has to be an eclectic cast of characters in a remote location with individuals being picked off one by one. I think it goes back to my childhood when I was in love with the game Clue and when I first saw Agatha Christie’s book And Then There Were None made into the movie Ten Little Indians. So naturally when I saw the premise for They All Fall Down—mansion in a Mexican paradise where a group of strangers gather only to be picked off one by one—I couldn’t wait to boot up my Kindle and dive in. Sadly, I almost DNF’d this book. At the 40ish mark I had met all of the characters, but nothing was happening (yawn). Then finally around 46% the book took off with a bang. I was riveted and had high hopes—until it quickly nosedived again. One of the most interesting characters is killed too early, I knew the killer’s identity from the first death, and guessed the reveal at the end. What I will say for the positive is that the author had a great descriptive voice and her MC was unique. There is some highly entertaining banter between several of the characters and the book reads easily. I did stick it out to the end, but none of the characters have any redeeming qualities which made it rough to finish. Loved the premise, but didn’t care for the outcome. 2.5 stars. They All Fall Down by Rachel Howzell Hall is about seven strangers brought together on a tropical island under false pretenses, each harboring a secret...... what's not to love in that plot? Miriam’s life is a wreck - her husband has a new girlfriend, her daugh rating 3.5 stars! Miriam’s life is a wreck - her husband has a new girlfriend, her daughter isn't speaking to her, but the police would like to. She receives an invitation participate in a reality show being done on a tropical island and she grabs the moment hoping her luck is improving. They warn her there will be no cell phones, internet or phone services of any kind and Miriam is certain she can win this competition. When Miriam arrives she realizes that everyone was called there to the island under false pretenses. Several of the guests begin to die as a result of strange accidents -- are they really accidents? The remaining guests start to get scared and suspicious of each other. Keep in mind these guests are all stranded on this island without a boat, without cell phones, internet or any phone service and the game shifts to a life or death situation. The plot of They All Fall Down is a guessing game with the big question being who is the killer, and who is dying next. I loved how the main character was known to lie, had anxiety and doubted whatever she saw. This book was definitely was a modern remake of Agatha Christie’s crime novel, And Then There Were None. 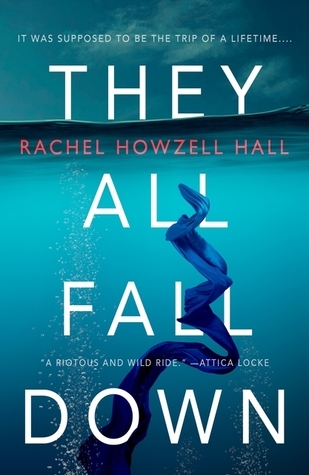 They All Fall Down is a twisty thriller that was fun and entertaining too. So. Freaking. Good. I could not put this one down. Hall takes us from the highest heights of luxury to the deepest depths of humanity's darkness. This is a thriller in which seven people go to an island and then thriller type things start happening. The chapters are interspersed with emails and newspaper clippings that fill in the backstory while the chapters advance the story's present. It was all well executed and I enjoyed reading it. Because of the nature of the book, I don't feel like I can get into any depth about the plot without treading dangerously close to spoilers. I’ve never read any Agatha Christie so I’m not familiar with the book that this tale was adapting. I am glad I got it on audio so it could hold my attention as I don’t think I would have stuck with a print it ebook copy. I typically don’t need to like anyone in a story...but there was just nobody to root for here. Everybody needed to die. I did have a theory about Philip but it was proven that I couldn’t predict the ending in this one! Twisty, turny, had me wondering in a wtf is going on???? way. I like an audiobook mystery that keeps me pondering things even when I'm not listening and I found myself wondering about Miriam, questioning how reliable a narrator she was and how everyone would meet their end. As a retelling of And Then There Were None you have to expect a high body count and a theme of just deserts but it was different enough to be interested in who was doing what and why. I liked the specific what that news articles were included in the book and the larger context they prov I like an audiobook mystery that keeps me pondering things even when I'm not listening and I found myself wondering about Miriam, questioning how reliable a narrator she was and how everyone would meet their end. As a retelling of And Then There Were None you have to expect a high body count and a theme of just deserts but it was different enough to be interested in who was doing what and why. I liked the specific what that news articles were included in the book and the larger context they provided. In the Year of our Lord 2019 it was nice to read a book about gross people getting their just desserts. Also, once the bodies start dropping I could not tear myself away. The pacing, the tension, it was beautifully done. The problem is that every single character in this book is gross. There's nobody here remotely likeable - which hey, not necessarily a problem but we also don't get a suitable anti-hero either. Literally, I hated EVERYONE in this book. And good pacing, thrilling suspense - it's j In the Year of our Lord 2019 it was nice to read a book about gross people getting their just desserts. Also, once the bodies start dropping I could not tear myself away. The pacing, the tension, it was beautifully done. Thank you to BookSparks for the free copy! I read They All Fall Down as part of the Winter Reading Challenge with Booksparks. Six people are invited to spend time on a luxurious private island under false pretenses. When they arrive, and things don’t quite add up, they find out the real reason they have all been invited to spend a few days on this beautiful island. Things quickly become less luxurious as strange accidents begin to happen, and the trust among the six vacationers starts to dwindle Thank you to BookSparks for the free copy! I read They All Fall Down as part of the Winter Reading Challenge with Booksparks. Six people are invited to spend time on a luxurious private island under false pretenses. When they arrive, and things don’t quite add up, they find out the real reason they have all been invited to spend a few days on this beautiful island. Things quickly become less luxurious as strange accidents begin to happen, and the trust among the six vacationers starts to dwindle. I loved our narrator, Miriam Macy, a single mom, with many flaws of her own. She accepted the trip in the hopes of turning around the life of herself and her daughter (who is currently not speaking to her). Each of the guests have something to hide and any one of them could be causing these accidents, and it’s Miriam’s goal to find out who it is before they hurt her. They All Fall Down was a quick read, and enjoyable thriller. I loved all of the characters and the storyline, and couldn’t wait to find out who was the main culprit at the end. Looking forward to more from Hall in the future! RACHEL HOWZELL HALL is the author of seven novels, including the critically-acclaimed Detective Elouise Norton series. The third novel in the series, Trail of Echoes, was published this past May and received a coveted Kirkus Star and was one of Kirkus Reviews 'Books That Kept Us Up All Night.' Land of Shadows and Skies of Ash (Forge) were included on the Los Angeles Times’ “Books to Read This Summ RACHEL HOWZELL HALL is the author of seven novels, including the critically-acclaimed Detective Elouise Norton series. The third novel in the series, Trail of Echoes, was published this past May and received a coveted Kirkus Star and was one of Kirkus Reviews 'Books That Kept Us Up All Night.' Land of Shadows and Skies of Ash (Forge) were included on the Los Angeles Times’ “Books to Read This Summer” for 2014 and 2015, and the New York Times called Lou Norton “a formidable fighter—someone you want on your side.” She is also collaborating with James Patterson and BookShots on the upcoming "The Good Sister." A featured writer on NPR’s acclaimed ‘Crime in the City’ series, Rachel has also served as a mentor in AWP’s Writer to Writer Program and is currently on the board of directors of the Mystery Writers of America. She was recently named one of Apple iBooks' "10 Authors to Read in 2017."